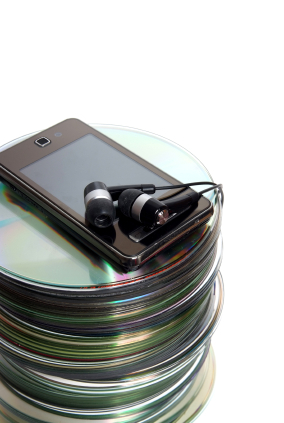 A few decades ago, audio cassette to CD were the most common audio media format. Now, no matter how much effort they put into bringing cassette tapes back, their efforts are futile… Two Squares provides Audio Cassette to CD Conversion Services so that your already captured and purchased audio recordings and music can be safely transferred to an updated format. 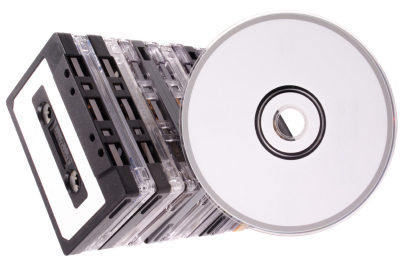 We have an extensive cassette to CD conversion process that ensures your music, speech, sermon, wedding music, or other audio file is preserved for years to come. Once we have transferred it from the magnetic cassette form, it will be in a safe format to transfer and share. 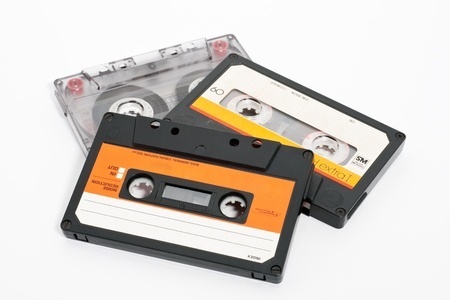 Audio cassette tapes have been used for many purposes over the years beyond just pre-recorded music albums that you may have purchased at the store. Many people used home cassette tape recorders to capture precious memories such as music and vocal recitals, wedding audio, speeches, interviews, sermons, or lectures. As with most magnetic based tape, audio recordings need to captured digitally before they are lost, damaged or degrade to a point in which they cannot be saved. 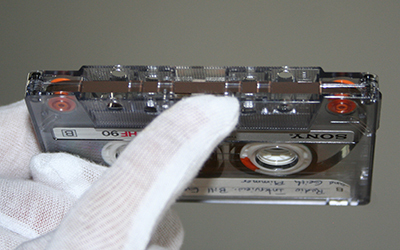 The method of “dubbing” tapes (copying to another tape) in the past was a way to preserve them and refresh the recording back onto new media, but these copies would also be subject to degredation due to fact that they are a second generation copy and they still would be subject to break down over time. Once you have converted your old magnetic media to a digital format you will no longer lose quality even if second, third or further generation copies are made. The following is an example of a voice recording taken from a 30-year-old audio cassette. It demonstrates a very low noise floor achieved through pre-process baking, a studio grade deck, proper system grounding and power conditioning, shielded cabling, etc. With this example, we did not apply any digital noise reduction or any other digital post-processing. The following example is an instrumental recording that was recorded off the radio 40 years ago onto an audio cassette. This example demonstrates the effects of our post-processing and digital noise reduction techniques. Please use high grade speakers or headphones to be able to best hear the difference. 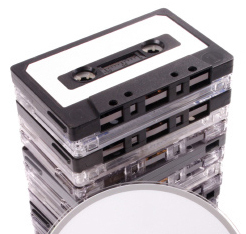 Audio cassette tapes, reel to reel tape and other forms of magnetic tape degrade over time. The tape will curl and stick onto itself causing hiss, pops, warbles and other unwanted noises in the playback. It is best to rejuvenate the tape before digitization to maximize the sound quality. The Two Squares magnetic tape rejuvenation process will greatly improve older tapes playback and ensure the highest quality digitization possible. NOTE: If your tapes are more than 10-15 years or have not been stored in a cool and dry place, it is best to NOT play your tapes before bringing them into Two Squares. You may damage your tapes and you can “gum-up” your tape player heads. The design and manufacturing of quality cassette decks are a thing of the past. The best quality decks were made in the 80’s and early 90s and a good unit can be hard to find. If you still have a quality deck available to you, it would likely need some work to make it sound like it was intended. Magnetic heads need to be properly maintained and drive belts and tires will stretch out and/or crack on older tape decks. A deck that has been sitting for an extended time may experience a variety of issues including the potential of “eating your tapes”. 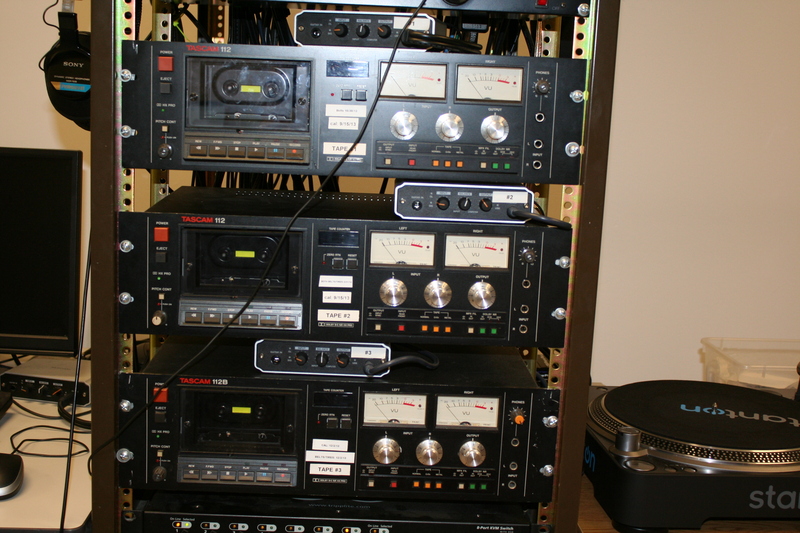 To the left is a snapshot of one of the Two Squares racks containing studio grade audio tape decks, power conditioning, and capture equipment. Most computers do have the ability to digitally capture audio if you have the right cabling, however, a standard computer sound interface will give you less than desirable results. Computers have a lot of “electronic noise” from switching circuits and the constant hum of several fans that are used to cool your computer components. This noise will bleed into your capture and will create a variety of hisses and unwanted tones in your recording. Even for a non-audiophile listener, this can be a very noticeable. The best quality comes from properly grounded, studio grade digital conversion devices that isolate your studio grade cassette deck from the noises on your computer. Two Squares uses only studio grade audio equipment from companies such as Tascam, Otari, and Harmon Kardon. Our equipment is also professionally restored, maintained and tuned to ensure the best possible quality of digitization. Even if you have the best quality playback equipment, there still will typically be noise in the original recording if your tape was not recorded in a professional environment or perhaps there is noise due to tape aging. There are several cheap or free software packages that claim to improve the quality of you digital recording by removing pops, hisses and other noise. But, just as with many things in life, you definitely get what you pay for. These programs may have the ability to remove some of the noises, but fully automated software cannot adjust for every noise situation effectively. You will likely be doing more harm than good with these software packages. Nothing can beat a skilled audio engineer with a trained ear and a variety of tools to choose from to do the best job possible to remove the unwanted noise from your charished recording. Two Squares has the experience and professional grade software tools to provide you with the best possible Audio Cassette to CD conversion. The images below illustrate an audio waveform captured digitally by a Two Squares Technician and the spectral representation as he processes the data to lower the noise floor. By using spectral representation, he can visually identify and distinguish the noise from the wanted sound giving us the ability to properly post process your tapes. Two Squares can convert the audio from a cassette tape to a set of MP3 files which can be copied to an iPod, hard drive, or flash drive.